As with any operation, the key is to minimize production costs. With a CoMate Ash Modifier application as part of your operating strategy, combustion efficiency is improved, maintenance is reduced, and operators can enjoy much fewer and shorter shutdowns, peak capacity output on demand, and an overall more predictable and efficient system. This graph depicts the actual average stack temperature at various loads during a full operating cycle of a 175 MWe power boiler. Stack temperature is a key indicator of boiler efficiency. A 5.6 °C drop in stack temperature represents a 1% gain in boiler efficiency. 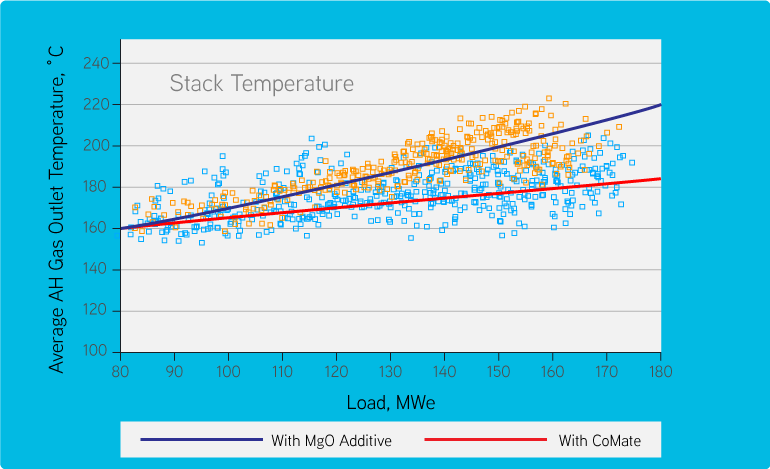 It is clear that at all loads, when compared to previous operating seasons where a magnesium-based additive was used, the stack temperature was markedly lower when CoMate was applied. In fact, at maximum load of 175 MWe, the difference was approximately 30 °C with CoMate. In addition, all five outages for cleaning of the boiler were eliminated, and the boiler delivered its best performance since it was put into service in 1968.